Hawai‘i's Official Tourism Site - Contains information about upcoming events and activities, sightseeing, accommodations, and more. (Chinese, German, Japanese, Korean, and Spanish language versions available as well). 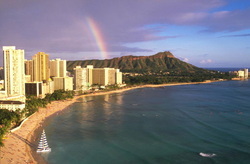 Visit O‘ahu - Information specifically about O‘ahu including sample itineraries, activity ideas, events, and more. (Chinese, German, Japanese, Korean, and Spanish language versions available as well). Get in some quality beach time - Hanauma Bay (snorkel in an extinct volcanic crater), Kaliua Beach (beautiful beach for taking strolls), North Shore (famous "pipeline" surfing beaches), Waikiki Beach, and more await all around the island. Museums to feed the cultural soul - We have many museums featuring Asian and Pacific art, such as the Honolulu Museum of Art and the Bishop Museum (which has the largest collection of Hawaiiana anywhere as well as exhibits for the kids) as well as the Hawai‘i State Art Museum. ‘Iolani Palace - ‘Iolani Palace, the official residence of Hawaii’s monarchy, is a marvel of opulence, innovation and political intrigue. Meticulously restored to its former grandeur, this National Historic Landmark in downtown Honolulu tells of a time when their Majesties, King Kalakaua, who built the palace in 1882, and his sister and successor, Queen Liliuokalani, walked its celebrated halls. Reservations required. SALT at Kaka‘ako - Named after the pa‘akai (‘Ōlelo Hawai‘i for “salt”) ponds that once dotted the low-lying wetlands of this area, SALT at Our Kaka‘ako is Honolulu’s epicenter for local culture, food, shopping and innovative events. Comprising of 85,000 square-feet of curated retail, restaurant and mixed-use space, SALT is a dynamic city block designed for exploration and engagement. ​Farmers markets - Sample fresh island produce and culinary creations at our many local farmers markets. NOTE: This is solely for informational purposes. We do not endorse any particular child care service.